Did you know that PSTA has a special division within its Transportation Department that’s dedicated to safety and security? Well, we do, and they’re a busy bunch of people! PSTA was recently notified that we scored 99% on a base assessment of our safety and security programs and procedures by the Federal Department of Homeland Security (DHS) Transportation Security Administration, which would make us eligible for their Gold Standard for the second time! Only those agencies with the best ratings receive the Gold Standard Award. 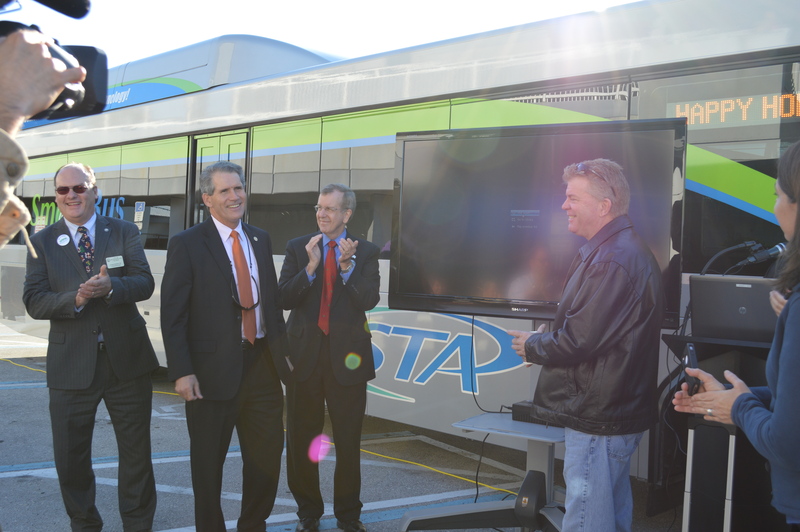 PSTA is a very safe transit system, with several state-of-the-art tools in place to help us keep it that way. We know where every bus is at any given time thanks to GPS technology on board every vehicle. Our Operators are trained how to respond and communicate with first responders in the event of an emergency on board, or if they witness a crime or emergency along their routes. And, all buses have audio and video surveillance systems so we record everything that happens inside and outside the bus (PSTA Customer Service Centers have similar surveillance). We’ve funded many of these improvements as well as cameras and security measures at our facilities with DHS grant funds. PSTA continues to have a successful relationship with our Federal security partners. Safety and security is very serious business, that’s why in 2010 we jumped at the chance to apply for additional grant funding from the Federal DHS. For Phase One of the 2010 project we wanted to encourage passengers, and the general public, to trust their instincts and report anything doesn’t look or feel right, or seems out of place. A special brochure that describes “suspicious activity” and “suspicious objects,” and how to report them, was distributed on board PSTA’s fleet of vehicles and at several large-crowd events in Pinellas. A second component of Phase One was the development of a first responder training module for local emergency responders and law enforcement use. When we applied for Phase One funding, we also asked DHS for future consideration of a Phase Two to implement a mass media campaign to further promote public awareness of security issues related to public transportation. Because a safe and secure transit system means more than combating terrorism and security measures, we decided to take a more people-centered approach to the mass media campaign. DHS officials told PSTA they favor this people-centered approach with all their supported outreach campaigns. The TV ads point out the safety and security features of our fleet such as the Real Time Bus Information system, which riders can use to find out exactly what time the bus is coming, and therefore minimize wait time at a bus stop. Another in the series talks about how PSTA’s Bus Operators are professionally trained and that the system has received national security awards. The final ad in the series talks about PSTA’s fleet of hybrid buses and how commuting on these vehicles helps protect the environment, as well as providing a safe and secure ride to work. The radio, billboard, and bus ads further enforce these messages. It is important to recognize that the message in the series of ads is public awareness of security issues related to public transportation. Improvements to frequency and service that would come with the Greenlight Pinellas Plan will reduce wait times, thereby making the system even safer. So, pointing people to both the website where we talk about the future vision of transit, and the PSTA website where they can see our current system, just makes sense. It’s another example of how PSTA leads the way in providing safe and secure transit options while serving our community with total transparency and fiscal responsibility. After careful consideration and debate Monday evening, the City Leaders of Belleair Bluffs voted 3-2 to endorse the Greenlight Pinellas Plan. “I’m pleased to include Belleair Bluffs as being among the many forward looking cities in Pinellas County that have endorsed this comprehensive transit improvement plan,” says Commissioner Joseph Barkley, who also sits on the PSTA Board of Directors. “This is a financially sound, sensible and viable approach to improving our transportation system to a level that finally rivals those of our peer cities across the country.” Barkley, along with Mayor Chris Arbutine, Sr. and Commissioner Jack Nazario voted to support a resolution endorsing Greenlight Pinellas, while Vice-Mayor Taylour Shimkus and Commissioner Suzy Sofer opposed the endorsement. At the heart of the Greenlight Pinellas Plan is a referendum set for November 4, 2014, which will ask voters to approve a funding change for the Pinellas Suncoast Transit Authority from its current .7305 mil property tax to a 1% sales tax (not applied to groceries, medical items and limited to the first $5,000 of any purchase). That change would allow for significant and foundational improvements to the county’s transit system, giving residents and visitors more convenient and varied transportation choices. Those enhancements will then form a foundation of quick and easy connections to a passenger rail line from St. Petersburg to the Gateway/Carillon area and to Clearwater, which is expected to be running by 2024. If the Greenlight Pinellas funding change doesn’t pass, the plan also encompasses service cuts of nearly 30% in 2017 when PSTA’s reserve funds will be depleted. The transit agency is currently experiencing all-time record ridership and gave more than 14.45 million rides in 2013. Despite the loss of more than $40 million dollars in property tax revenues since 2008 coupled with fare increases and significant cuts in service – PSTA ridership has grown by an impressive 19% over the same period. 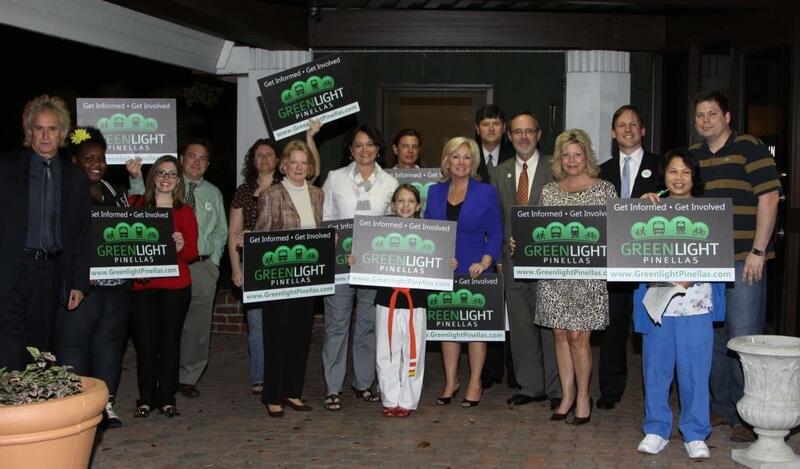 Details of the Greenlight Pinellas Plan along with Q&A and background data can be found at www.greenlightpinellas.com. After nearly two months of in-depth analysis and study, experts from the engineering firm of HNTB and financial firm Ernst & Young have confirmed the financial viability of the Greenlight Pinellas transit improvement plan. In a presentation to the PSTA Board of Directors today, CEO Brad Miller detailed the plan’s fiscal structure and the corroborating findings from the outside financial experts. The Greenlight Pinellas plan is based on two comprehensive and detailed studies that have become the blueprint for a successful expansion of the county’s transit system. The first was the two and half year Alternatives Analysis (AA) study completed by Jacobs Engineering in partnership with PSTA, the Pinellas County Metropolitan Planning Organization, the Florida Department of Transportation, and the Tampa Bay Area Regional Transportation Authority. The second was the PSTA Community Bus Plan conducted by Transportation Management & Design, Inc. Because the AA portion of the project used 2011 dollar figures, local leaders and members of the public asked for a validation of the cost estimates to ensure that the cost of the rail element of the plan is still within the original projection of $1.5-$1.7 billion. HNTB examined the cost estimates completed by Jacobs Engineering and determined them to be valid and correct. HNTB’s estimate of $1.68B (2011$) was used by Ernst & Young Infrastructure Advisors as a key base case assumption along with other key assumptions to the financial model including cost escalation, revenue/grant forecasts, phased implementation and debt financing. PSTA officials and partner agencies engaged thousands of people from every sector of the community to help craft the Greenlight Pinellas plan. Leaders say that input has been integral to creating a plan that is reflective of the community’s desires and transportation needs. “Because this is a 30-year plan, we’ve included numerous contingencies so that we can easily adapt and modify it to accommodate future economic and cultural realities,” adds Borchers. In November 2014 Pinellas County citizens will be asked to approve funding for the Greenlight Pinellas in a referendum that would, if passed, replace the current PSTA property tax with a 1% sales tax (not applied to groceries or medical-related products). Details, background data and avenues for community input can all be found at the plan’s website: www.greenlightpinellas.com.